MARQUETTE — UP Health System-Marquette recently received a renewed accreditation from the National Accreditation Program for Breast Centers, after initially receiving the accreditation in 2012. “The NAPBC focus is to provide the best up-to-date treatment for patients with diseases of the breast and to improve the quality of care and monitoring of outcomes of these patients. This is achieved by setting standards of care based on scientific evidence and through education,” said Dr. Sheetal Acharya of Hematology/Oncology at UPHS-Marquette. The accreditation provides “assurance for patients that have breast cancer or are being screened for breast cancer that they’re getting the best care that they can get,” said Beth Schloegel, Oncology Services Senior Director and registered nurse at UPHS-Marquette. With only about 20 health care centers in the state having this accreditation, it’s a notable achievement for UPHS-Marquette’s breast cancer treatment center, Acharya and Schloegel said. “We’re just really, really proud to have the accreditation, we want to be able to offer the best for our community,” Schloegel said. When a healthcare system is accredited by NAPBC, it means officials visited the hospital, spoke with staff, and thoroughly reviewed documentation to ensure compliance with standards. “There are 28 standards that we need to meet annually, so we need to document all of the things that we do to ensure that we’re giving high-quality care to our patients on an on-going basis,” Schloegel said. To receive and maintain accreditation, the breast center is assessed regularly to ensure standards are continuing to be met. The standards developed by NAPBC are based upon many aspects of care for those who have breast cancer. “There’s so many standards and everything from having a multidisciplinary breast care conference, to having multidisciplinary patient management, imaging, complying with surgical standards, the genetics evaluation and management, (to) having a survivorship care plan for our breast cancer patients,” Acharya said. The group works together to form individualized treatment plans for each patient, as they understand each person and situation has specific needs. “So much goes into individualizing a treatment plan for a patient,” Acharya said. “Things such as characteristics of the tumor, a patient’s age, the underlying genetic predisposition, if any, and also, of course taking into account patient’s wishes and what they feel is right for them,” Acharya said. Genetic counseling is offered at UPHS-Marquette, as understanding the genetic basis of breast cancer can be an important aspect of individualized treatment — hereditary forms of breast cancer, while uncommon, typically require a more aggressive course of treatment than acquired forms of breast cancer. “To be able to identify the patients who should be counselled for genetics testing early on in the treatment plan is important because it can lead to a different course of treatment,” Acharya said. While not every patient with breast cancer will need to see a genetic counselor, Acharya says she is glad that patients at UPHS – Marquette have access to the genetic counseling resources. “To have access to that kind of service is really wonderful, all accredited institutions should have a genetic counselor but not all of them do, especially in smaller towns, and so to be able to have that here is great,” Acharya said. The team of oncologists, pathologist, radiologists, surgeons and other professionals involved in treatment meet weekly because regular and efficient communication amongst the team ensures a high standard of coordinated, individualized care, they said. In addition to oncologists, pathologists, radiologist and surgeons, a nurse who works as a breast navigator is also on the multidisciplinary treatment team. “She’s able to help guide the patients through all of this because it’s really overwhelming,” Schloegel said. The navigator accompanies patients to appointments throughout the course of their diagnosis, treatment and post-treatment care, helping to record and explain the large amount of complex information presented to patients facing a breast cancer diagnosis. “When you are getting all of this information, it’s really hard to digest and comprehend all of it, later on, if the patient has questions they can call the breast navigator,” Schloegel said. The navigator continues to work with a person even after treatment is complete to ensure they are getting the information, care and support they need. The survivorship care plan is reviewed amongst the survivor and their treatment team and sent to their primary care physician, ensuring that all parties are aware of the person’s history, needs and plan moving forward. 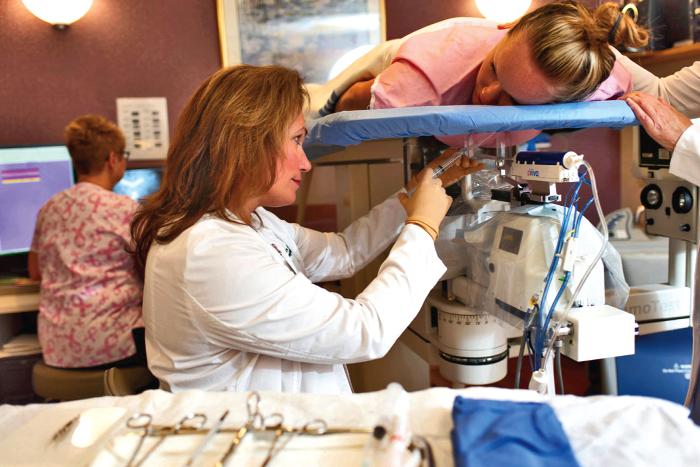 It’s this type of care that distinguishes UPHS – Marquette’s breast cancer treatment center and led to their continuing NAPBC accreditation, Acharya and Schloegel said. “We’re really, really proud that we’ve had this accreditation for as long as we have, we have a lot of engagement from our physicians and nursing staff (and) everyone that’s part of the breast cancer program,” Schloegel said. Many positive things are on the horizon for UPHS – Marquette’s breast cancer center, Acharya said.